Class society ABS has granted approval in principle (AIP) to a new wind turbine transport vessel devised by Neptun Ship Design of Germany. The proposed Blue Azurit concept has been designed to transport the parts for turbines greater than 9MW, including monopiles, transition pieces, towers, nacelles and blades. 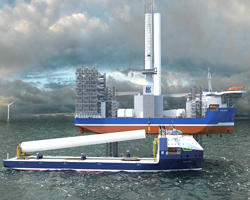 The Blue Azurit design is intended to help the offshore wind support sector “meet pressure to reduce costs, minimise project risks, deliver higher reliability and support renewable energy targets from new offshore wind nations,” comments Neptun, which was acquired in Q1 2019 by shipyard group MV Werften. The concept is deemed to be in compliance with ABS Rules for Building and Classing Offshore Support Vessels, 2018. The planned vessel would feature a length of 171.8m bpp, a moulded beam of 36.5m and a draught of 5.5m. The Blue Azurit’s flush cargo deck is intended to span some 4,200m² and will be strengthened to handle loads of up to 15tonnes per m². Onboard accommodation will be arranged for up to 44 persons. The concept also features DP2 station-keeping capabilities, so the vessel can hold its position against wind speeds of approximately 20knots and wave heights of 2m. The vessel would be powered by Siemens’ BlueDrive PlusC diesel-electric propulsion system, for a speed of 16knots at 85% MCR, while a ship motion-compensated platform with an SWL of 850tonnes will facilitate the safe handover of turbine parts.